The Lord hungers for devotion, which he finds but rarely. He sells himself to the devotee who attempts for his grace with pure devotion. All devotees are dear to Lord Hari. As the soil derives its importance from the flower in bloom, as the socket derives it’s importance from the diamond studded in it and as the cloth derives its importance from golden thread woven in it, as Shirdi derives its importance because of Sai Maharaj and so does GROTON, Massachusetts derives its importance because of the NESSP Sai Baba Mission Center and Sai Temple. This mission for Sai is itself a right step in the right direction that is most important step for all. With the grace of Shri Sai and the support of devotees has made the impossible possible. The establishment of the Mission Center and Sai temple is a reality now. The construction is in full swing and the completion is expected by Dusshera, 2016. NESSP is pleased to share that in year 2015, we had received good funds from across North America, includes a 170k donation from Atlanta based devotee and a 1.7 Million dollars donation from an anonymous group of donors. Although the mission center is based in Massachusetts, the overwhelming support is there from states like North Carolina, Florida, Illinois, New Jersey, New York, California, Atlanta in addition to being supported by devotees from Massachusetts, New Hampshire, Maine, Rhode Island and Connecticut. 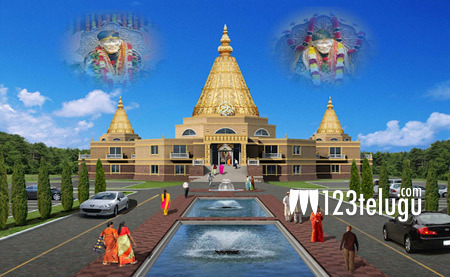 With the divine’s blessings and devotees support NESSP would achieve the construction of Largest Sai temple in North America. As of today the organization is falling short of 500K to complete the first phase of temple construction. NESSP seeking community donations and generous financial support from all the devotees and donors for reaching the goal and each of your contributions will make a huge difference to it. This is a once in a lifetime opportunity to support this divine cause and we seek your support financially and in spreading the word. NESSP Wishing you all a very Happy and Prosperous 2016!!! NESSP is a standalone nonprofit organization, 501C (3), Tax Exempt status from IRS (Tax ID-20-5288174) currently located in Chelmsford, Massachusetts. Hail Shri Sai…Always rest in our hearts and minds and mentor us towards the right path.